October 3, 2012: Listen as Ronna Prince is interviewed by Dr. Robert on the Dr. Robert Show. January 24, 2011: Listen as Dr. Backstrom is interviewed by Lilou on her Juicy Living Tour. January 23, 2011: Listen as Ronna Prince is interviewed by Lilou on her Juicy Living Tour. "A remarkable and heartfelt journey……” by Robert Pease, Ph.D., Author of Spiritual Bootcamp: This Is Your Wake Up Call. 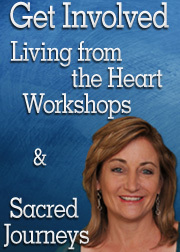 The remarkable and heartfelt journey that Ronna Prince explores in her film Sacred Journey of the Heart will inspire you to explore an even deeper voyage into the healing of your own life. This is a courageous film which captures the essence of how vital it is for modern society to move into a heart based humanity. Sacred Journey of the Heart affirms that the beat of each heart communicates to everyone the symphony we make as human. You will love this movie for its time has come and we are listening to every heartbeat.